2， 联系John Andrew Boehner is the 61st and current Speaker of the United States House of Representatives. A member of the Republican Party, he is the U.S. Representative from Ohio's 8th congressional district, serving since 1991. I am disturbed by what you relate to me, profoundly disturbed. The fact that he would egg children on and that he would find any comments about killing anybody a joke is appalling. What troubles me is that many people are inured to this kind of talk as entertainment -- until someone acts on it, then it is a spectacle and becomes round the clock news, and that also turns into prurience and entertainment. I support a petition that we should send to Nancy Pelosi and to John Boehner to sanction talk such as Kimmels. Where Kimmel will be hurt most is his source of money. So whoever sponsors during his show should be contacted to comment on how wrong what he said and did is, and then a threat of boycotting their products should be issued if they don't respond or handle the matter with a lightness that sometimes companies and corporations do. Eric Holder, the Attorney General, who is going after hate crimes, prosecuted by the Justice Department, and well-enforced by the F.B.I., should get a letter signed from representative members of the Asian community, and from the non-Asian communite, allies, demonstrating that we know and believe that what Kimmel did is criminal: it is hate speech, and that it cannot go unsanctioned. The United States found Anwar Al Awlaki's preaching hatred enough to track and send a Unmanned Aerial Vehicle to take him out, and they were justified in doing so because his hate speech translated to action, inspired action to kill others. 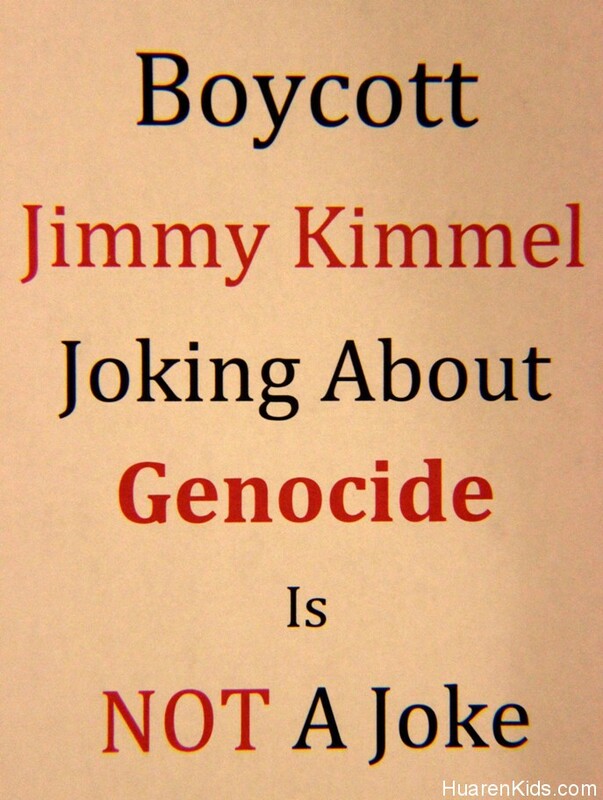 Mr. Kimmel's actions and encouragement, and making of a serious matter into a 'joke', is not justifying the same, but it does mean that in our democracy and in doing what is right we must hold him accountable and make note that such statements are unacceptable. Freedom of speech does not include the incitement that stokes the desire to kill others.